It’s been a funny night in Houston. The Texans were hit with a personal foul for making contact with a long-snapper. Danny Amendola threw a touchdown. DeAndre Hopkins had one of the most insane catches you will ever see nullified by offsetting penalties. But the wildest play of all has to be this ridiculous....I don’t even know what the hell it is. But it rules. 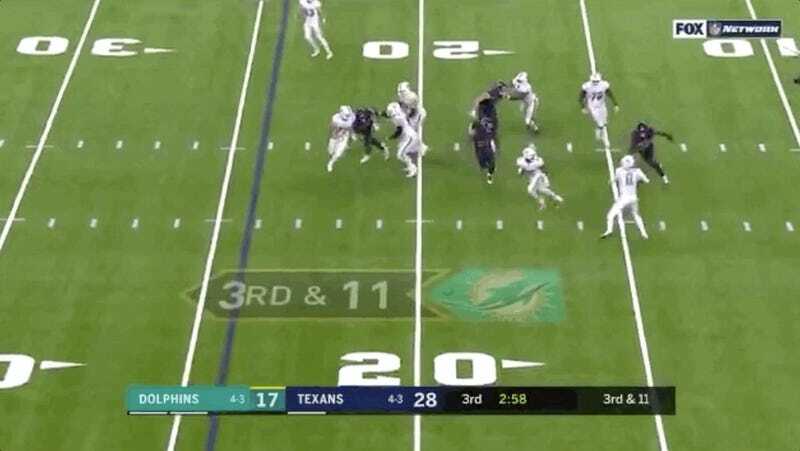 That is the ball getting smashed out of the hands of Jakeem Grant, ricocheting off the helmet of Texans defensive back Natrell Jamerson, flying another 12 or 13 yards up the field, and being caught by DeVante Parker. Of course, the Dolphins failed to capitalize on their incredible luck, and the drive ended in a field goal.